Beautiful, Natural, Real.Sea Shells Mixed Beach Seashells. Beach home decor use. For example, Spread a few tiny starfish and seashells with grains of beach sand in a fishtank or vase. Beach wedding or wedding shower decoration. Christmas decorations such as wreath and tree decor and even package embellishment. All sorts of crafting needs , Perfect accents for candle making, nautical decor, ornaments, floral and wreath making. Seashells are a natural product not intended for children under the age of 14. CAUTION! Shells have sharp edges and points. Handle with care.. Weight and size - Quantity of products depends on shell's weight and size,generously sized at 0.5" to 3",each set contains approximately 50-80 sea shells. Decoration - String them to make jewelry or affix these mini conchs to surfaces for craft borders，natural sea shells add a fresh touch to nautical or beach decor. 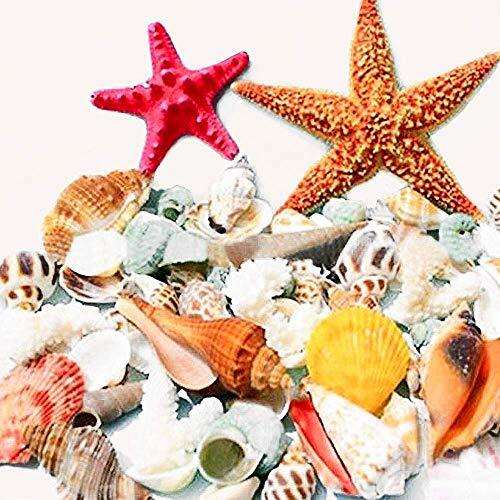 DIY ＆Creat - Nice accents for candle making, seashell ornaments, shell wreaths and add a colorful accent to a basket of beach shells, perfect for any arts & crafts project. Strong packing - Strong packing to ensure good condition on arrival. View More In Floral Arranging. If you have any questions about this product by Anyumocz, contact us by completing and submitting the form below. If you are looking for a specif part number, please include it with your message.